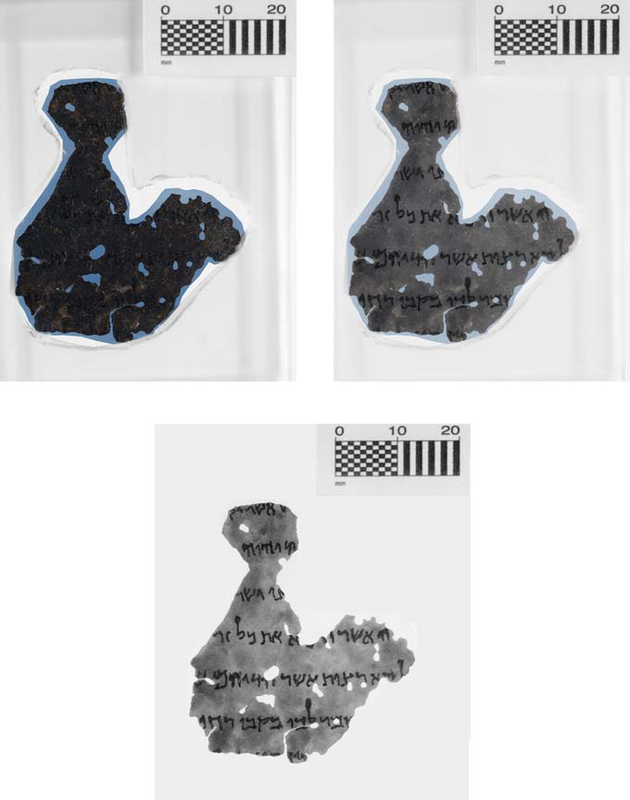 My colleague Kim Phillips has written a post on the ‘fragment of the month(?! )’ blog on a fascinating fragment in the Genizah. He has stacked his post with interesting things to know. Jean-Louis Simonet sends word that he has published a critical review of Curt Niccum’s book, The Bible in Ethiopia. 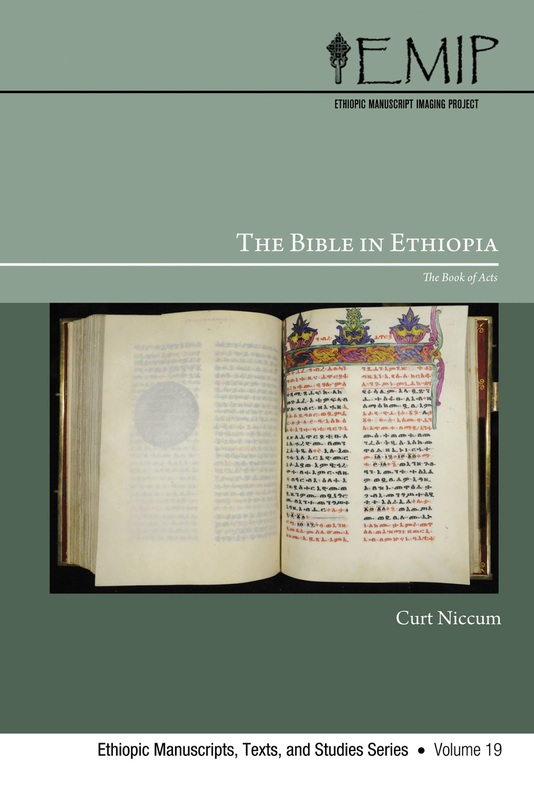 The Book of Acts (2014) in J-L. Simonet, ‘Le livre des Actes dans la Bible éthiopienne. A propos d’un livre récent’ BABELAO 5 (2016), 117-125. This is available online here. NB. The name BABELAO means « Bulletin of the Abelao », more precisely « Bulletin de l’Académie Belge pour l’Etude des Langues Anciennes et Orientales » (Bulletin of the Belgian Academy for the Study of Ancient and Oriental Languages). 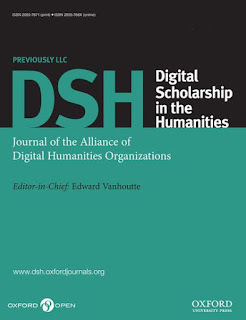 It is a scholarly online journal, see further here. Texts and Versions of the Hebrew Bible will publish high level studies on the Hebrew text and textual history of the Bible and on the ancient translations. It provides an avenue for discussions focused specifically on the text, language and textual history of the Hebrew Bible and it manuscript traditions. In addition, with the growth in interest in the ancient translations both as evidence of the text of the Bible and as versions of inherent interest in themselves, the series encourages studies of these ancient witnesses, including their textual history, translation technique, exegetical methods and setting. 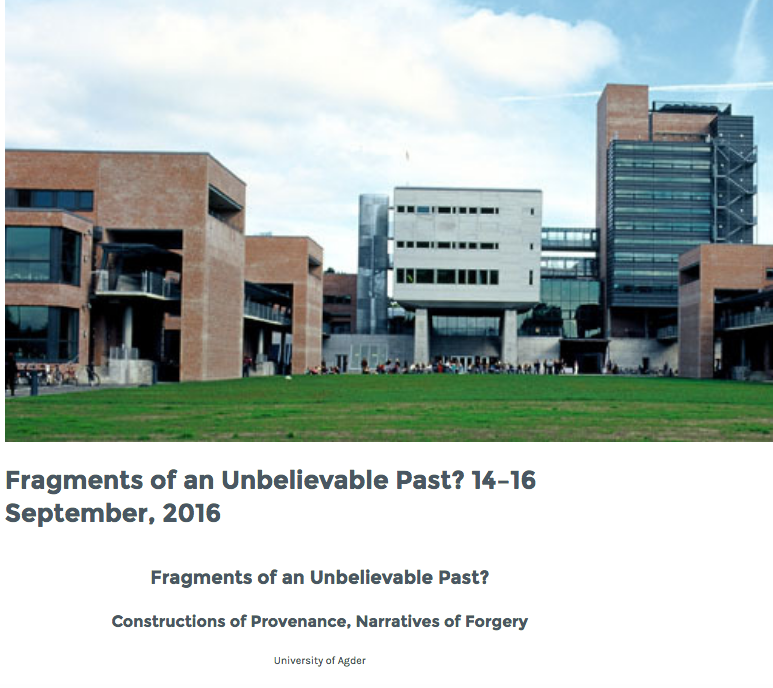 On 14-16 September I will participate in a conference at the University of Agder in Kristiansand (Norway), Fragments of an Unbelievable Past? Constructions of Provenance, Narratives of Forgery – conference schedule below (not including coffee and meals). I will present a paper on the famous 19th-century forgerer Constantine Simonides: “Simonides’ New Testament Papyri: Their Production and Purported Provenance.” Since the Friday is devoted to the Gospel of Jesus Wife saga, including the concluding conversation between Prof. Liv Ingeborg Lied (MF, Oslo) and Ariel Sabar about his his recent Atlantic Magazine investigation, I will also attempt to draw some parallels between Simonides and Walter Fritz – the owner of the Gospel of Jesus’ Wife fragment (for our earlier post on Fritz, see here). 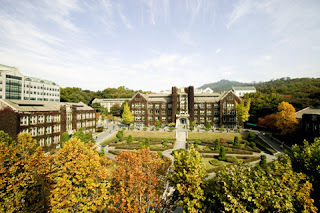 I look forward to the conference very much. See more about the conference on the blog of the organizers, The Lying Pen of Scribes. 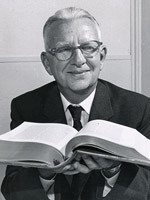 Westcott and Hort and E. C. Colwell are often connected in discussions of singular readings as they should be. But it’s not often appreciated how Colwell inverted WH’s primary purpose for studying singular readings. For WH, their main interest in singular readings was that their two prized manuscripts (01 and 03) often stood alone from the rest of the textual tradition as they knew it. Singular readings did give them access to the proclivities of 01 and 03 (a la Colwell), but this was not then aimed at elucidating transcriptional probability like it was for Colwell. Instead, this exercise was aimed squarely at determining which of 01 and 03’s singular readings had “a better title to consideration,” i.e., of being original (Intro, p. 233). For Colwell, the study of singular readings is not only to “increase skill in the evaluation of that manuscript” (a la WH), but also “to gain knowledge of the habits of a scribe in general ... and thus to increase skill in the evaluation of readings.”* For Colwell, such a study was not aimed at identifying which singulars may claim originality. Rather, it was to give us access to those readings that we can be sure are the scribe’s rather than the author’s. Thus, unlike WH, Colwell’s interest in singulars hinges entirely “on the assumption that these readings are the creation of the scribe.” As such, they give us access to the work of the scribe as opposed to the author. In this, Colwell has reversed WH for whom the study of singular readings was aimed precisely at identifying those singulars that are the work of the author rather than the scribe. In other words, both recognize that singular readings can attune us to the scribe’s habits, but each uses this fact to focus on opposite sides of the scribe/author divide. WH are ultimately interested in authorial readings whereas Colwell is really interested in scribal readings. Obviously, this has to do with whether each thinks that singulars may be original. But the difference is still important especially as it comes to “skill in the evaluation of readings.” WH have their own view of how to best attain that and it has nothing to do with singular readings. But more on that another time. 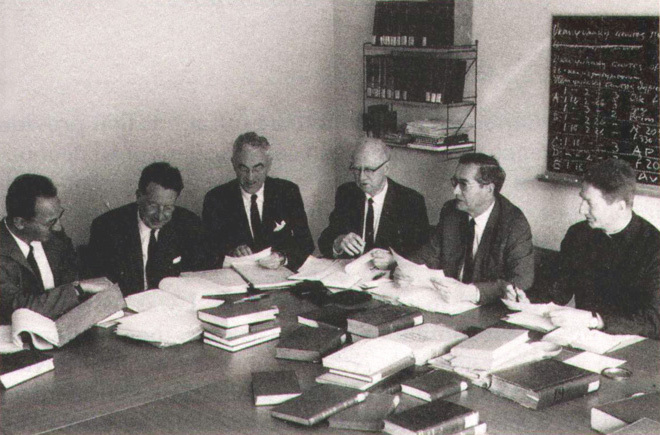 *E. C. Colwell, “Method in Evaluating Scribal Habits: A Study of P45, P66, P75,” in Studies in Methodology in Textual Criticism of the New Testament, NTTS 9 (Leiden: Brill, 1969), 108. What finally gave it away was the superscript “Sa” which I thought had to be for “Sahidic.” That meant, of course, that the “T” must actually be a “C.” Sure enough it was. 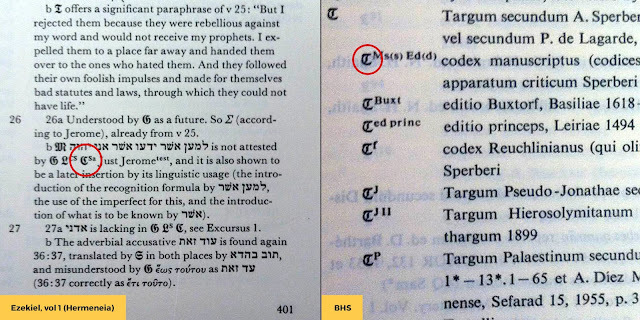 But comparing this “C” in the Hermeneia volume on Ezekiel to BHS’s “T,” you can see the obvious problem. All of this would be avoided if simple Roman letters had been used. Now, look, I enjoy the wonderful Gothic “P” for papyri as much as anybody. It looks cool and it adds gravitas to what are often scrappy manuscripts. But I say it’s time to banish Gothic letters from our writing and apparatuses for good. They’re bad for electronic searches, they don’t exist in most fonts, and whatever value they once had is gone. They only create confusion. So let’s get rid of them. Who’s with me? Pete Williams sent word yesterday that the first volume of the Publications of Museum of the Bible was published this week. 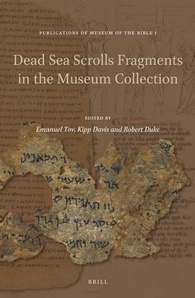 Dead Sea Scrolls Fragments in the Museum Collection is edited by Emanuel Tov, Kipp Davis, and Robert Duke and features 13 previously unpublished Dead Sea Scrolls fragments. A number of introductory essays help explain the Museum’s collection and the program that led to this volume. That program, known as the Scholars Initiative, is one of the book’s unique features. The program involves dozens of undergraduate and graduate students who are given the opportunity to help with fresh research on the museum’s artifacts. As someone who has been through this program, I can say that the opportunity it affords to young students is unparalleled. It is a fantastic way to mentor and train students interested in Biblical research. 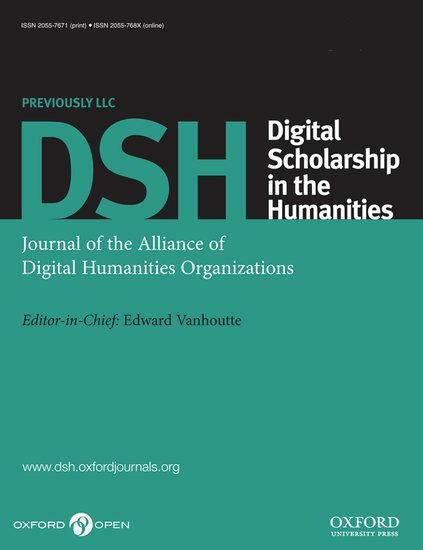 The risks of involving students in this level of research are (hopefully) mitigated by the tiered structure of the program where students are overseen by scholar-mentors who are, in turn, overseen by the editors of the volumes (here Emanuel Tov). A special shout-out to Michael Johnson who was in the first “class” of the Scholars Initiative with me and who became one of the “principal investigators” in the volume (see p. xiii n. 15). Genesis 31:23–25?, 32:3–6 (Inv. motb.scr.000124) Elaine Bernius et al. Exodus 17:4–7 (Inv. motb.scr.000120) Karl Kutz et al. Leviticus 23:24–28 (Inv. ncf.scr.004742) Karl Kutz et al. A Fragment of Leviticus? (Inv. motb.scr.000122) Marty Alan Michelson et al. Numbers 8:3–5 (Inv. motb.scr.003173) Timothy D. Finlay et al. Jeremiah 23:6–9 (Inv. motb.scr.003172) Karl Kutz et al. Psalm 11:1–4 (Inv. motb.scr.000121) Lisa M. Wolfe et al. Daniel 10:18–20 (Inv. motb.scr.003170) Robert Duke et al. Nehemiah 2:13–16 (Inv. motb.scr.003175) Martin G. Abegg Jr. et al. οἶδα ποῦ κατοικεῖς, ὅπου ὁ θρόνος τοῦ σατανᾶ, καὶ κρατεῖς τὸ ὄνομά μου καὶ οὐκ ἠρνήσω τὴν πίστιν μου καὶ ἐν ταῖς ἡμέραις Ἀντιπᾶς ὁ μάρτυς μου ὁ πιστός μου, ὃς ἀπεκτάνθη παρʼ ὑμῖν, ὅπου ὁ σατανᾶς κατοικεῖ. The trickiest part here is grammatical—what should we do with the nominative after ἐν ταῖς ἡμέραις when we expect genitives? The commentators will tell you that scribes tried to smooth this by adding αἷς before Ἀντιπᾶς and that’s what we find in the Byzantine text. The syntax still isn’t great since we’re left with a verbless clause, but some have suggested that it is implied. Others have followed Lachmann’s conjecture of Ἀντιπᾶ (the “proper” genitive of the name) suggesting that the sigma arose from dittography involving the article: αντιπα ο μαρτυϲ → αντιπαο ο μαρτυϲ → αντιπαϲ ο μαρτυϲ. That is one too many steps for my liking though. I know where you dwell, the place of Satan’s throne, and you hold fast my name, and you did not deny my faith even in the days when you contended, even my faithful witness, because every witness of mine is faithful, the one who was killed among you [omit]. So we have (1) the verb “you contended” substituted for the name “Antipas,” (2) the long addition of the phrase “because every witness of mine is faithful,” and (3) the omission of the final clause “where Satan dwells”—none of which you will find in the NA/UBS editions. You have to go all the way to Hoskier (or at least a footnote in Beale) to find the addition. The first variant has a good explanation in that Ἀντιπᾶς is sometimes spelled αντειπας and this could be read as an Aorist form of ἀντιλέγω. Hence we get ܚܪܐ in Syriac which means “resist, dispute, contend,” etc. in the ethpeal. Tischendorf tries to explain the Syriac as a translator’s failed attempt to render the name. But explaining it as a different way to read the Greek is much more viable especially because Hoskier lists several Greek minuscules that seem to accent it as the verb (ἀντεἶπας rather than ἀντειπᾶς). The third variant, the omission of the last phrase, is a bit easier to explain in Syriac than in Greek. In Syriac, it looks like a case of homoioteleuton involving ܐܠܐ at the beginning of v. 14. The phrase is included in the Harklean Syriac manuscripts, so, apparently, it didn’t last long. It’s only attested by two minuscules in Greek perhaps just by accident. The second variant, the addition, is the most surprising of the three. It is also not unique to the Syriac, being found in over a dozen Greek minuscules. This suggests that the Syriac is not innovating but rather reflecting its Greek Vorlage. In his edition, Gwynn argues the same but still calls the longer reading an “interpolation.” What he doesn’t mention but should have is that its omission has an obvious explanation by way of homoioteleution, the scribe’s eye jumping from πιστός to πιστός (cf. GA 2028). Rev 2.13 in GA 2028 (15th cent.) showing the longer reading. What’s important is that the Syriac shows that this reading has much earlier support than the Greek evidence alone would suggest. It goes back at least to AD 616 when the Harklean Syriac was completed and probably earlier since the Crawford MS (the basis for the BFBS and Gorgias editions) likely predates the Harklean. This is thus a good example of late Greek manuscripts preserving much earlier readings. It also illustrates the benefit of keeping an eye on the versions. None of this made it into the sermon, you’ll be relieved to know. But I wonder if some of these readings shouldn’t make it into the Nestle apparatus. The longer reading in particular belongs there not only for its exegetical significance, but because, at least transcriptionally, it can explain the shorter reading. If I have my chronology right, this was written when Aland was already part of the UBS committee. Unfortunately, he doesn’t explain what makes the difference between a hand-edition and a major critical edition such that a committee is good for one and not the other. It seems a bit inconsistent. Aland (second from right) with the UBS committee. Both manuscripts were copied in the second half of the 15th century for cardinal Bessarion, who donated them to the Venice library, where they still are. GA 205 is Gr. Z. 5, and GA 2886 is Gr. Z. 6. Interestingly, when it comes to the only other part of these manuscripts for which I happen to stumble over a bit of information, the situation is different. In the introduction to 2 Esdras in the Göttingen edition, Hanhart gives an exemplar for both of these manuscripts (in the Rahlfs list GA 205 = 68; GA 2886 = 122). That in itself is quite interesting, because having the parent and the child opens up all sorts of interesting areas of study. The exemplar for Venice Bibl. Marc. Gr. 5 for the section 1 - 2 Esdras, Esther, Judith, Tobit, 1 – 3 Maccabees is another manuscript in the same library, namely Bibl. Marc. Gr. 16 (Rahlfs 731), a 13th century manuscript. For Venice Bibl. Marc. Gr. 6, for the same section, the exemplar is a different manuscript, one that is reasonably well known, namely B, Codex Vaticanus. As this copy was made before 1468, this is an interesting part of the late-mediaeval history and use of the big 4th century Vatican Bible. Just going by what we read in the handbooks on New Testament textual criticism, one would never have sensed that the formerly anonymous 205abs had been in such close contact with one of the more famous witnesses to the Greek Bible - the latter may have been its direct parent in parts of it. The question is of course what will happen when we compare these three whole Bibles in their totality. Alan Mugridge, Copying Early Christian Texts: A Study of Scribal Practice (WUNT 362; Tübingen: Mohr Siebeck, 2016). Blurb: It is widely believed that the early Christians copied their texts themselves without a great deal of expertise, and that some copyists introduced changes to support their theological beliefs. In this volume, however, Alan Mugridge examines all of the extant Greek papyri bearing Christian literature up to the end of the 4th century, as well as several comparative groups of papyri, and concludes that, on the whole, Christian texts, like most literary texts in the Roman world, were copied by trained scribes. Professional Christian scribes probably became more common after the time of Constantine, but this study suggests that in the early centuries the copyists of Christian texts in Greek were normally trained scribes, Christian or not, who reproduced those texts as part of their trade and, while they made mistakes, copied them as accurately as any other texts they were called upon to copy. International SBL finished a few weeks ago in Seoul, South Korea. I did not go, but Jacob Peterson did and he has kindly agreed to summarize the text critical papers he attended for us. Thanks, Jacob. The International Society of Biblical Literature meeting was held at Yonsei University in Seoul South, Korea from 3–7 July this year. This was both my first time visiting Asia and my first ISBL. The culinary and cultural experiences alone were worth the visit and I could write a much more interesting series of posts on sampling Korean street food and visiting the DMZ. But since this is the ETC blog, I suppose I’ll stick to covering the two textual criticism sessions. While I don’t have prior experience to compare against, there was enough interest in the textual criticism sessions that some attendees were left standing against the wall or sitting on the floor. I apologise in advance if I have misrepresented anyone’s paper or missed out on a key element from their presentation. The two text-critical sessions were back-to-back on 5 July and fell under the heading “Working with Biblical Manuscripts (Textual Criticism).” The first session had the theme “Greek New Testament Manuscripts” and featured three presenters. Pasi presented a paper titled “Textual Evolution in Acts 5:38–39 of D and the Effect of Social-Historical Context.” In the paper, Pasi demonstrated a new way for using data from the CBGM to investigate the textual history of the text present in Codex Bezae. In particular, he examined how the various manuscripts attesting the expansions of Acts 5:38–39 present in Bezae reveal the stages of development of that text. Additionally, he showed that a careful study of the social-historical context can potentially reveal explanations for the expansions; in this case, he pointed out changing attitudes among Christians towards Gamaliel as evidenced by the Gospel of Gamaliel. Next was my own paper, “New Readings in Papyrus 46,” in which I examined the text of P46 in Col. 1.23 and 2.7. Based on the new images produced by CSNTM, I argued that P46 contains a previously unknown singular reading, αμετακινητοι, in Col. 1.23. Then I argued for understanding P46 as reading εν τη πιϲτει in Col. 2.7, which is an instance of P46 joining with Sinaiticus against Vaticanus. Dr. Lafleur presented his ongoing research on the manuscript collection at the Albanian National Archives in a paper titled, “Working with Biblical Manuscripts in a Non-Biblical Context: A Detailed Approach of the Greek New Testament Manuscripts from Albania.” He discussed some of the past research conducted on the manuscripts, but also the preservation of the manuscripts by the Albanians and, more recently, the Chinese. Dr. Lafleur surmised that one of the reasons these manuscripts of Christian scriptures were not destroyed was because they were now viewed as cultural pieces demonstrating the skill of Albanian preservationists. InChol presented a paper titled, “A Text Critical Analysis of the First Taunt Song in Hab. 2:5-8,” that focused on using paratextual features in manuscripts as guides. In particular, he pointed to the spacing and line gaps present in some manuscripts of Habakkuk as a means to understanding divisions in the text which ultimately aids in interpretation. Dr. van der Bergh gave a presentation on “OT Awareness of Ps. 109:1 (LXX) in Codex Bezae.” In his talk he discussed the eight citations of Ps. 109:1 in Codex Bezae and how they differ. His analysis showed that the scribe did not show a tendency towards harmonization and had an apparent lack of awareness of the LXX form of the text. Dr. Carlson gave the concluding presentation titled, “The Text and Timing of the Antioch Incident (Gal. 2.11–14)” which I believe was an expansion of the section from his monograph dealing with the same passage. Dr. Carlson argued convincingly for the reading τινας … ἦλθεν over τινας … ἦλθον in Gal. 2.12. The larger result of this text-critical decision is that it resolves the exegetical problem surrounding the timing of the Antioch incident. I very much enjoyed my time in Korea and getting to interact with the other participants. I look forward to seeing everyone in San Antonio for national SBL… I call dibs on the Brill display.